Over time, your Atlanta rental property can begin losing value. And with many different tenants rotating in and out of your rental properties, you may have to deal with more damage and issues than you would like. Even with all the fixes you make that are necessary, the property could be slowly losing value. But there are changes and upgrades you can make that will help your rental properties increase in value without spending too much money. The investments you make on your rentals should help to increase the property value without making improvements that are over the top. You should be able to see a return on investment through these improvements and spending a ton of money on certain renovations may be an over-improvement, and a waste of money. However, there are many things you can do that will increase your Atlanta rental property’s value, allow you to charge more for rent, and provide you with a positive return on investment. At Atlantic Property Management, we know a lot about rentals and how to help you find the right tenants and improve your properties’ value. Knowing exactly where to invest your money to get the most out of your rental property may be difficult, and it certainly isn’t the same as investing in your own house. In this blog, we will go over some of the best improvements to make to help increase your return on investment. Let’s start with curb appeal. While there may be different issues inside the property that need fixing, the outside of the house is what gets people interested. If the outside of your Atlanta rental property looks fine and just needs to be cleaned up, then head inside to invest in the more important things. A quick coat of paint can make a huge difference, especially in the eyes of potential tenants. Mow the lawn, prune bushes, clean up old piles of leaves, paint the front door, and make the outside of your home bring in the tenants. If you are willing to spend more money on the outside of your rental, there are a few things that could really help add curb appeal—new siding, an added deck, a new driveway, and updated landscaping could help to give your property an improved look and help get people interested in your rental. The fixtures in your Atlanta rental property can become old and dingy pretty quickly. Replacing and updating these can help give your property a newer look and help to increase the value. Door knobs, cabinet handles, light switch covers, as well as light fixtures can all be changed out to give the space a fresh appearance and improve value. Getting matching fixtures can help to create a unity throughout the home and help tie it all together, which many people look for in homes. Upgrading plumbing fixtures can also help. 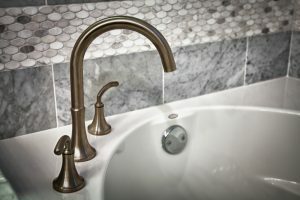 Replace old faucets, kitchen sink sprayers, shower heads, and even the sink itself to add more value to the rental property and give the place a newer feel. These can really begin looking old and replacing them all with matching fixtures can help add to the home. Replacing both home fixtures and plumbing fixtures with matching style can truly create unity throughout your home. The matching fixtures will add a ton of value to your property and will catch the attention of potential tenants. Windows are like anything else in your home, they get old and will eventually need to be replaced. If the windows in your rental are beginning to look aged and not working as efficiently as they should, it may be time to consider replacing them. Adding new windows to your Atlanta rental property can offer many benefits, besides just adding to the look of the home. New windows can help with the home’s energy efficiency, keeping a tight seal and not allowing drafts to enter the home. If your tenants pay for their heating and AC use, they will love the thought of having new windows and being able to spend less. Flooring is an easy replacement that can add a ton of value to your rental. If you have old and ratty carpet throughout your home, swapping it out for laminate, tile, or hardwood flooring can greatly increase the home’s value. While some tenants may prefer carpet, other types of flooring, especially high-quality flooring, can outlast carpet, add value and appeal to your home, and is much easier to maintain and care for. Even hardwood can easily be sanded down and refinished for a quick update years down the road. Carpet can get disgusting and be home to dust, bacteria, and allergens, replacing the carpet with other flooring types can help to create a cleaner environment for your tenants and can be beneficial for those with bad allergies. This could be very appealing to tenants and will add value to your home. Laminate countertops are generally what is found in rental properties, but they can start looking old quickly and ruin the overall appearance of the home. 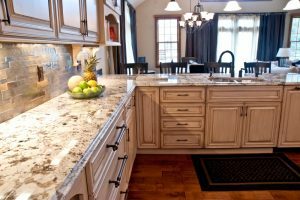 New countertops, whether they are slate, granite, or another type of solid material, can give the property more value as well as add beauty and durability to your property. These new countertops with will last longer than the lower quality styles and will be adding to the home for years. Change the countertops in your kitchen to start. This is, as they say, the heart of the home, and new countertops in this gathering area will catch the eye of potential tenants. If you want to do more with countertops, swap out the old ones in your master bathroom and other bathrooms to add even more unity to your home. Nowadays, people have a lot of things and need a lot of space to accommodate for those things. Homes with a ton of storage are often more appealing than those with only one closet. Adding storage to your rental can help to add value to your home and attract more tenants. Whether you add more cabinets in the kitchen, have a shelf built into the wall in the living room, or add a closet to a room that has extra space, creating more storage in your rental can be very beneficial for you and your future tenants. If your Atlanta rental property is on the smaller side, adding on to your home may help. Adding more square footage to your property will help add value and will attract even more potential renters. Build on to your rental home by creating another bedroom, a bigger living room, or a more functional kitchen. This also goes for basements. Getting your basement finished and adding useful rooms and a functional layout can add value to your rental. While the renovations listed above can help to improve the value of your rental, there are also a few quick touchups that you can do to help make your rental value increase. These include painting both the interior and exterior, deep cleaning, updating landscaping, and staging the property so that potential renters can get a picture of what it will be like to live in. These small things can help improve value and attract more renters. Increasing the property value of your rental can help you build your portfolio, increase your profits, and can help appeal to renters. These simple renovations will not cost you a fortune but will help you to increase the return on investment. Your rental properties may not appear to need renovations or updates, but these can help you increase the value and make more money. If you need additional help with rental information or finding a full-service Atlanta property manager, contact Atlantic Property Management. We can help you build your portfolio, find the right tenants, and increase the value of your rental.